Offer poker, casino, and a sportsbook. Windows and Mac friendly, plus the option to play in your browser is coming soon. 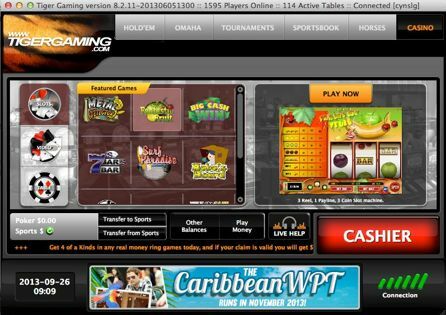 Tiger Gaming's poker and casino sites has been in business for 17 years and has a glowing reputation for a safe playing environment and first-class customer support. Tiger Gaming's software is easy to use, and the Chico Poker Network that it is part of, is widely regarded as one of the softest in the online poker world. Tigergaming is so sure that you will love its poker offering that it is prepared to give you a $2,500 bonus as soon as you sign up for your free account. Simply create your account via PokerNews, make your first deposit of at least $50 and Tigergaming will match it dollar for dollar up to a maximum of $1,000. All you need to do then is earn 1,500 Comp Points for every $5 of the bonus, and the bonus money is added to your poker account. Please note: In order to receive your bonus, you must email bonuses@tigergaming.com with the current bonus code, which can be found in the promotions section of the Tigergaming website. 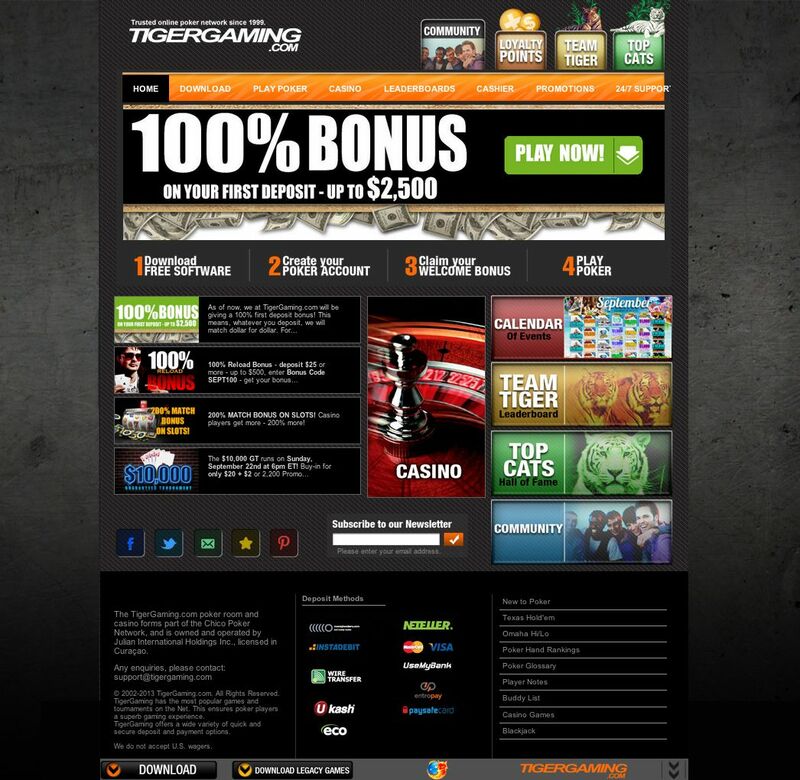 Tigergaming prides itself on allowing player to cash out quickly and have created a special guarantee for its players. Make a withdrawal to your Neteller, Skrill or EcoPayz account and if Tigergaming does not pay you out within 24 hours, it will double your requested cashout amount! The software used by Tigergaming Poker is extremely easy to navigate around as it is designed with recreational players in mind. 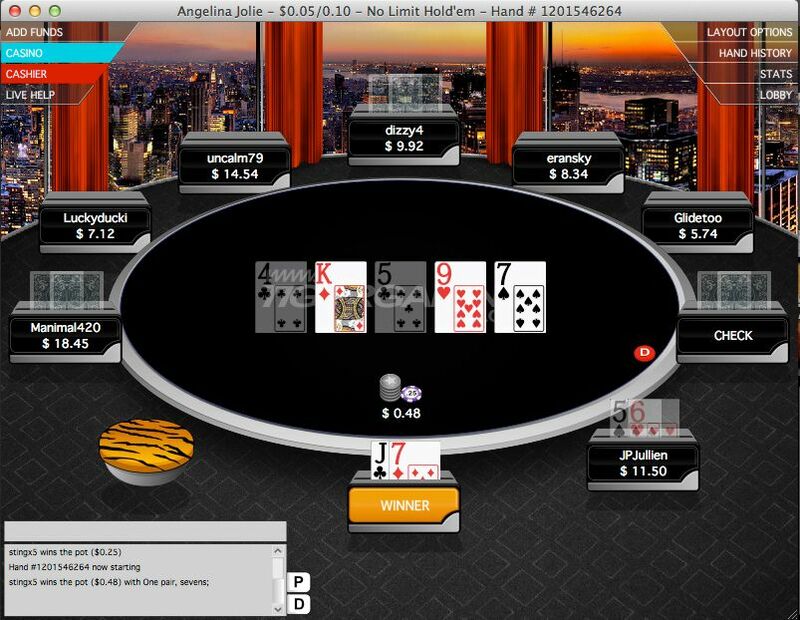 The poker tables have all the usual features one would expect from a major poker site, including the ability to play on multiple tables easily by "tiling" the tables. One great feature of the Tigergaming's lobby is that it contains a direct link to the site's Live Support team who is always ready to assist you with any issue or query you may have. Like for the majority of the online poker rooms around, the bulk of Tigergaming's cash game traffic is focussed at the Texas hold'em tables. Hold'em is available in fixed, pot-limit and no-limit betting structures with stakes running from $0.01/$0.02 up to $5/$10. 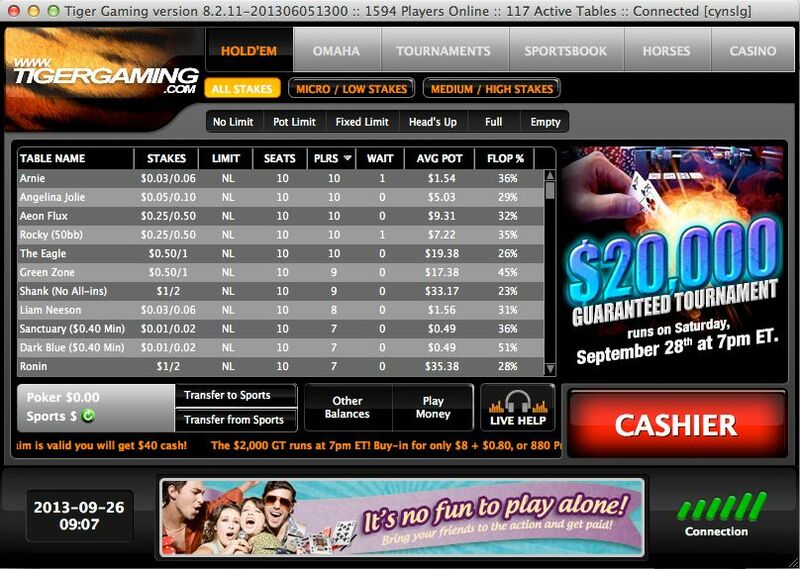 Omaha and Omaha hi-lo ring games are also offered, with stakes ranging from $0.01/$0.02 to $5/$10. Americana, 32 Card Draw, and Seven Card Stud are also offered, although these games run infrequently. 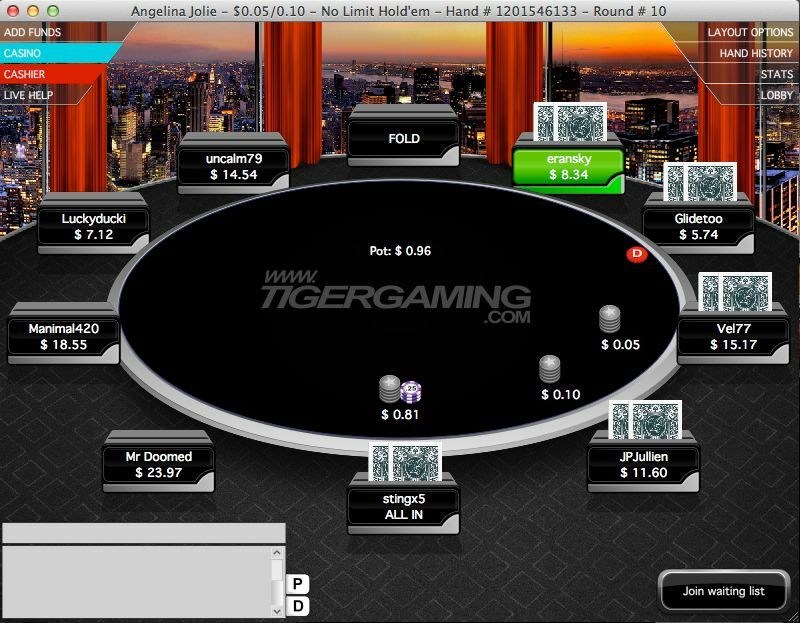 Tigergaming's poker client allows the room's players to easily connect with Tigergaming's online casino. Here, players can play Blackjack, roulette, slot machines and video poker in addition to some unique and exciting poker games such as Chinese Poker, Big 2, 7 Card Stud, Guts Poker and Pan. Tournament poker is one of the most exciting forms of the game because it gives players the chance to turn a small investment into a huge sum of money! This is particularly true at Tigergaming where at least $100,000 is guaranteed every weekend. Like most online poker sites, Sunday is the day that the biggest tournaments run. At Tigergaming you can play in a $10,000 guaranteed, $15,000 guaranteed, a $20,000 guaranteed tournament every Sunday, with the last Sunday of the month seeing a $50,000 guaranteed event take place. During the week there is a daily $7,500 Winners Series tournament costing only $11 to enter, which also awards 10 tickets to the monthly $50,000 every week. For those of you who want to win some free money, Tigergaming has hourly freerolls that feature prizes of between $10 and $100. Tigergaming not only likes to attract new players, but also loves to retain its loyal customer base. At Tigergaming you'll find a $20,000 Cash Race leaderboard, a $5,000 weekly Sit 'n' Go leaderboard, and a $5,000 weekly tournament leaderboard. New depositing customers are invited to compete in a First Depositors Freeroll which has a $5,000 prize pool. This takes place at 8:00 p.m. ET every Sunday and you'll receive a free ticket to it when you make your first ever deposit on the site. Other cross-selling offers include risk free casino, sports and horse racing bets. Players who wish to make a real money deposit at Tigergaming can do so via the following methods: Skrill, Neteller, Visa, Mastercard, InstaDebit, Ukash, Ecopayz, PaysafeCard, Wire Transfer and Entropay. Tigergaming's excellent customer support is available 24 hours per day, 7 day per week. You can contact the support team via email or live chat. There is also a F.A.Q. section on the Tigergaming website.